One of the things that I planned to do, but didn't was to solder very flexible feeders to each point on the Microengineering turnouts. The points are a separate piece of rail that receive power from both ends, and the one end is through a rail joiner. Since I don't love adding feeders, and I was laying track at a rapid pace, I skipped the step. For the most part I haven't had any issues, even in the fully scenicked portions of the layout. But while I was running trains for an open house this past weekend, I did have a spot where the locomotive would frequently, but not always, stutter or stall. This is a location where two turnouts are connected points-to-points, so initially I thought that since there was no feeder in that location I'd add a pair. Once I add a bit of ballast, the new feeders will be entirely hidden. But it didn't resolve the issue. So I tested power on each separate piece of rail and found one of the two points is not receiving power. This is a scenicked and weathered turnout. So I cut a small piece of stranded wire, stripped the end and wrapped all but one strand to get them out of the way. I left a small section of insulated wire as a handle. I put a slight kink as a "hinge" in the wire, tinned it, and soldered it to the back side of the points, right above the rail joiner. It's almost entirely hidden behind the rail. If I need to to it on the front points, then I'd do it on the front of the rail to avoid issues with derailments, although it's small enough I'm not sure it would matter. Once I tested the rail for power, I cut off the "handle." Since I'm lazy, I'll only do this where it's actually needed, but it really took longer for the soldering iron to heat up (and for me to type this up) than to actually do the fix. Some more experimentation with weathering a reefer. 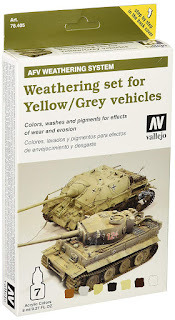 In an earlier post I had tried out Vallejo's Weathering Set for Yellow/Gray Vehicles. For Christmas I had gotten the Vallejo Dust and Dirt Pigment Set and when cleaning up the basement tried it out on half of one side of the model. 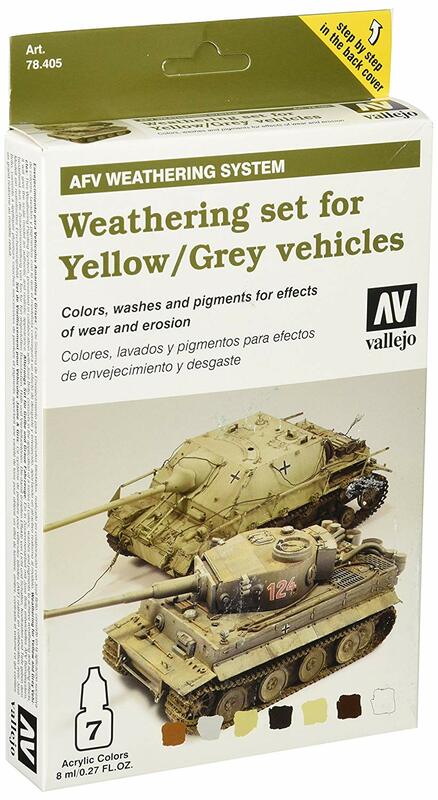 I asked for the set, because the weathering set included one bottle of a pigment. It's a dry powdered pigment that recommend you use dry, or using their airbrush thinner to wet the side first, or by using a pigment binder which lets you use more of the pigment to make a thicker layer of mud crusted on the model. I just used it dry to see how it would work. On the sides I used the Yellow Ochre and Desert Dust. On the hinges and around the framing that shows on the side sill I also used some of the black and Burnt Umber. I really like the way it looks. You can clearly see the difference, with the additional weathering with the pigments on the right half. I particularly like the way the hinges came out. I have not tried a clear coat yet to see how much it might alter the finish. You can see how the right side looks, well, dusty. It looks really good in person too. So I recently picked up the last Bethlehem Steel gondola that I didn't yet own (LV) from Tangent. It's a great looking and great running model, and it reminded me of how a couple of their gondolas don't run well because the wheels scrape the bottom of the car. They have suggested just using a Kadee washer, but I really didn't want to raise the car because I like how low they sit. I haven't taken any measurements to see if they run too low, so maybe that's the correct fix. In any event, after removing the trucks, I attacked the weight with my Dremel and (what I think is) a routing bit to take off just enough material to make them run freely. It was easy to figure out where to do it, because the wheels had left marks on the bottom of the car. I believe the cars that had the issue were the ACF 70-ton welded cars, and it may have been a single run that had an issue. The Wabash car was the first Tangent model I got and Bill and I were impressed by its rolling characteristics. When a second run was released I picked up the PRR and DL&W car (pictured) and those were the ones that had this problem for me. Extremely well done models otherwise. 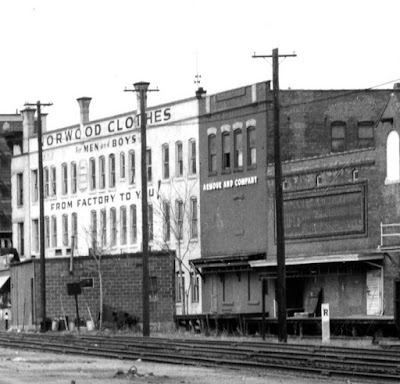 Here's a crop of a photo of New Britain Yard in the late '50s if I recall. It's a good shot to get details around this end of the yard, including the 'ring' post. The employee timetable note that the normal whistle signals for grade crossings were not used in New Britain, so there aren't whistle posts. But the main reason I made this crop is to get a better look at the Armour and Swift distributorships that both took reefers in my era. Of particular note is the "Swift's" sign, and you can barely make out the word "Swift's" next to three lines of text. Now at some point, I saw a photo of a Swift distributor with the same sign. My assumption is that it was in an article on meat reefers, or something like that. The three lines of text were yellow and legible, and I thought, "interesting, too bad I won't need that in New Britain." Aaaannnd then I found this picture. Apparently I did need that sign, and I haven't been able to find the photo since. So if anybody knows what the three lines of text are, or even better, have a photo so I can replicate it, that would be great! One of the few Sunshine kits I have is an ATSF Rebuilt Ft L & N flat car kit (#66.2). It's an interesting prototype, because it was originally built as a 50' flat car, and extended to 53'6" by adding a new section in the middle of the car when rebuilt. Another aspect I really like is that the early ATSF flat cars had fishbelly center and side sills. The Rock Island performed a similar modification with their USRA clone 43' flat cars, that they later lengthened by adding a 10'6" section to the middle of the car. Since the Red Caboose kit is a USRA clone flat car, I wondered how hard it would be to do the same? Well, it's a bit more work than might be expected. Pete gave me two extras he had, and I started experimenting. One issue is that on the extended cars, the wood decking extends beyond the car sides. On the Red Caboose kit, the deck is part of the (nearly) one-piece body. For some reason that I've never figured out, there is a section in the middle of the deck that is a separate piece. The top is an unmodified car, and the IC parts are both from the same model that I cut up. It's hard to see that the IC car is 10'6" longer than the PM car, but it is. There's a vertical rivet line where the crossbearer is on the original car, and I cut just outside that line (after measuring with a caliper) to get the right length. The rivet lines will be shaved off and two splice plates will need to be added. To get this far, I started by cutting off the ends. Then I scored along the seam between the steel side and the wood deck, and then a deeper score on the inside so I could snap off the deck. It will probably be easier to use a couple of kits, since the stake pockets won't be installed already, but I think it's definitely a viable project. I don't have any info on the underframe design, etc., yet so I'll need to do some research before progressing, but I like the idea and the two splice plates where the extra section was added will make for a unique car. 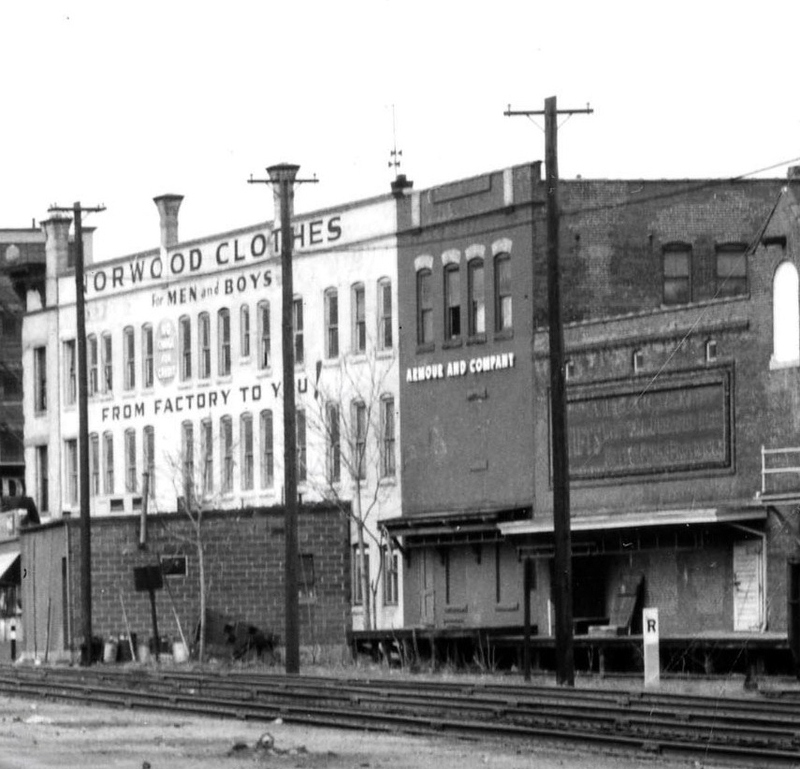 Additional cars were rebuilt from 46' flat cars and 7'6" additional sections. I don't have a photo yet, but it's possible that they could be similar other than the location of the splice plates. If you can find one, Sunshine produced the car as kit #45.9, but this looks like it will be a relatively easy and worthwhile kitbash. Perhaps that's how the masters for the kit were made? By the way - the ATSF kit I have (#66.2) has bulkheads. I don't need the bulkhead version, so I'm happy to trade for one of the kits without the bulkhead, or if somebody can use the bulkheads on their own, let me know.